Emotions have an impact on our health. Whether we’re feeling our heart bursting with joy, or our stomach in knots over anxiety, emotions are as much a part of our health picture as the status of our knee’s cartilage. In Chinese medicine there is a connection between disharmony in specific organ network systems and emotion. 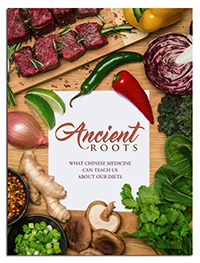 While science would say certain parts of the brain light up when we are experiencing different states of being, Chinese medicine would point to a specific element (Metal, Earth, Wood, Fire, and Water) and associated organs to explain the phenomenon. Like most concepts in Chinese medicine, there is a relationship between emotions and the organs that is reciprocal. In other words, emotions can negatively effect the organ, and an organ’s physical dysfunction can enhance our emotional experience. We know food effects our health – mental and otherwise – so it’s no surprise that an organ’s function effects our emotions. For example, if one has been on a holiday sugar fest for a week, you bet they are feeling lethargic, maybe a little more irritable and lacking in motivation. Conversely, if one is feeling anxious and irritable, they may crave the expansive qualities of sweet foods to self soothe. Conversely, there are positive emotions that affect each of the organs. In the same reciprocal dynamic, when an organ is healthy and vibrant, we experience these positive states of emotional being. Often translated as virtues in the classical texts on Chinese medicine, these positive emotions are worth exploring when working with the organs. If your acupuncturist has been working on strengthening the Kidneys, understanding and working with the associated virtue can be of great benefit to your treatments (even if you began coming in simply for knee pain). It’s all connected in Chinese medicine. The wood element is associated with the organ of the Liver. The emotion of the Liver is frustration, aggression, irritation or anger. Experiencing any of these emotions can be seen as the Liver energy not moving smoothly and evenly throughout the entire body. The virtue associated with the Liver is Ren, or benevolence. The type of kindness that is genuine, soft and gentle. The sort of kindness that brings a smile to the grouchiest of faces. The kind of gesture that leaves an expansive feeling of joy in the chest. In its simplest form, we can practice kindness during the season of Spring. As we cultivate benevolence in our heart-mind, we keep the vital energy of the Liver fresh and dynamic throughout the year. The wood element helps give us the guidance and direction to reach our goals, whether they are physical, mental or spiritual. Oftentimes, there’s some discontent in the Liver energy when we are not in alignment with our “path”. Sometimes that means a new plan should be laid out, sometimes cultivation of flexibility and patience is in order. The Heart is associated with the emotion of joy and its potential transgression into mania. The virtue associated with the Heart is Li and can be thought of as proper-ness. Other direct translations include words such as; polite, respectful, honorable. The reminder that there is something greater than self is found in this virtue. We can practice living in state of deep, genuine gratitude as a way to cultivate Li in our Hearts. Fire energy can also bring inspiration into form. Creative sparks, intuition, and the like can be part of the heart’s song. The Spleen is associated with the emotion of worry, over thinking or ruminating. The virtue is Xin and is commonly translated as faith, trust, belief or integrity. If we define faith as trusting our own deepest experience and our most unshakable beliefs, we naturally begin to feel trust settle in our bones. That faith and trust begin to percolate into our interactions with others as we stand tall within the integrity of who we are. It is trusting that there is a natural rate and rhythm for all cycles to turn. It is honoring the seasons of change in our lives, knowing deeply that all that is needed will be provided. The Lung is associated with the emotion of grief and its virtue is called Yi. The translation of Yi is fairness and tells the story of brotherhood and sisterhood. There is an aspect of surrendering personal desire for the benefit of others. There is an aspect here that pertains to instincts. What do your instincts tell you about what is right? Listening to hunches and to your gut response to situations, while thinking of others first is a way to cultivate Yi in our Lungs. The emotion of the Kidneys is fear and the virtue of the Kidneys is Zhi. Zhi is commonly translated as knowledge, wisdom, humble. There is an old adage: how did the ocean get to be king of all the water? It lay lower than all the rest. There is great wisdom to be found in humility. Together these five virtuous qualities are seen as every human’s birthright (a part of the very tissue of your body itself). When a person is true to themselves, they will be natural and spontaneous. These virtues are all about remembering and not attaining. Our lives should always be about cultivating: the breaking down of patterns we acquire (as opposed to our true nature) & the remaking of the world/self on a continual basis. It is said these five virtues live within our skin and have the ability to transform disease. The latter I cannot speak to, but the idea of people remembering the virtuous nature of their organs delights me to no end. Amanda Johnson (AJ) practices at Thompson Family Acupuncture Clinic in Walla Walla, WA. She loves to show patients how Chinese medicine is fantastic at relieving body pain, aiding recovery and enhancing vitality. When not in the clinic, she will be out hiking, cycling, or playing in the water.